Diamond-quality sales and customer service is a cornerstone of long-term success for Tiffany & Co., the world’s premier jeweler and America’s house of legendary design since 1837. That’s why when the iconic specialty retailer faced mounting logistical challenges in assuring cohesive brand messaging across the globe, it bolstered its traditional learning management system (LMS) with a powerful, centralized, app-based training and communication platform. The two solutions complement each other while addressing different goals to support Tiffany’s commitment to extraordinary customer experiences. The video-based INCITE content is “fluid, consistent, very relevant, bite-sized and actionable, and helps us communicate the key messages we want all sales professionals to have in terms of our brand history, legacy and storytelling, makes those narratives relevant and extremely timely — and delivers them instantly on a mobile device,” reported Olivier. Since the videos are resident in the iPad, they are non-streaming and instant-on, like a light switch, regardless of store bandwidth — further drawing sales professionals to engage with the interactive content. 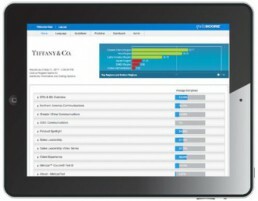 Unlike Tiffany’s successful inhouse LMS program, which is purely a Human Resources tool, the INCITE tool also allows multiple departments within Tiffany & Co. — including store operations, corporate communications, merchandising, product knowledge, and learning technologies and systems — to centrally communicate to employees, with a specific hierarchy in place in terms of what’s needed to be successful within a particular timeframe. This ability to streamline and centralize communications from various departments, along with INCITE’s many other features, sold Tiffany & Co. on blending, not replacing, its traditional LMS with the new mobile platform. This ability to streamline and centralize communications from various departments, along with INCITE’s many other features, sold Tiffany & Co. on blending, not replacing, its traditional LMS with the new mobile platform. Today Tiffany & Co. is bringing the app-based INCITE mobile communications solution to its management and thousands of sales associates in 313 showcase stores in 28 countries, with training and messaging translated into ten different languages. Individual engagement with the bite-sized training modules, and results of subsequent quizzes, are verified and addressed by regional, district and store managers around the world, to reward and support personal growth as needed. In his presentation during NRF 2017, titled “Customer First: Transform the In-Store Experience and Drive Performance1,” Olivier described why Tiffany & Co. married its LMS with the INCITE2 training and communications platform from Multimedia Plus, and the many “exciting results” now being realized. Not only does the INCITE platform allow more consistent, highly-branded communications, “the content is very short, very strategic, thoroughly targeted, video-based and delivers exactly what the sales professional needs to know at a particular point in time, as well as the immediate actions those strategies reference,” reported Olivier. Not only does the INCITE platform allow more consistent, highly-branded communications, “the content is very short, very strategic, thoroughly targeted, video-based and delivers exactly what the sales professional needs to know at a particular point in time, as well as the immediate actions those strategies reference,” reported Olivier. In addition to the patented, instant-on video, the innovative mobile app also features a drag-and-drop self- publishing interface; granular targeting; real-time metrics; instant, internal global broadcasting from an iPad or desktop; and a simple dashboard interface. Training modules and other communications designed to enhance the store experience unfortunately are useless if not accessed by the associate. That’s why — whether a survey, assessment, picture quiz, what-if sales situation or other content — Tiffany & Co.’s regional, district, field and store managers leverage INCITE to determine whether employees engaged, and how well. Live results on the back end provide this insight to allow managers to move the mark with coaching as well as rewards. In addition, from a corporate perspective, results also can reveal where program improvements are needed. If most regions are answering the same question wrong, for example, Olivier’s team can examine that question and immediately edit it for clarity. Tiffany branded its INCITE training and communications initiative as “57th and 5th,” in recognition of the company’s flagship New York store location. To introduce the new solution to employees worldwide, the company created an internal marketing video, titled “In-Store Mobility: Elevating the Training and Communications Experience.” The presentation visually demonstrated the many new capabilities now available via the iPad; explained how training can take place anytime, anywhere; stoked excitement for the Tiffany-branded rollout; and helped ensure everyone understood its use case. professionals but all store and operations professionals – and is tailored to recipients based on their role. And while corporate training and messaging about a new product launch or specific attribute may go out to the global Tiffany audience, “57th and 5th” also allows localization such as regionally-specific communications, while still maintaining messaging continuity and consistency. One especially useful feature of the INCITE platform is its short, on-floor, “in between customer time” training capabilities. This keeps sales professionals on the selling floor, allows them to jump in and out of the modules to learn something new every few minutes, and avoids the inefficient use of payroll expended for backroom training. It’s great to quickly review a straight-forward outline to start the day right, putting my most important focus on the client. 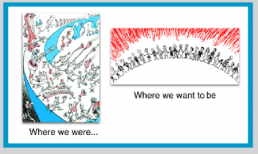 Helps me understand that what we do as sales professionals goes a long way in a client’s experience. Helps me keep focused on what creates memorable experiences for my clients. Each course was brief so it did not require me to constantly stop and redo sections. Feedback from Tiffany & Co. management is clear: Choosing INCITE as a complement to its LMS — not a replacement — was a successful “and” decision, not “either/ or.” As anticipated, today the two compelling solutions work separately yet together to enhance and support the diamond-quality sales and customer service that continues to be a cornerstone of Tiffany & Co.’s long-term success.